^ "Constellation Information | European GNSS Service Centre". www.gsc-europa.eu. Retrieved 11 February 2019. ^ a b "UseGalileo - Find a galileo-enabled device to use today". www.usegalileo.eu. Retrieved 12 January 2019. ^ "Galileo launch brings navigation network close to completion". 13 December 2017. ^ "Latest batch of Galileo satellites enters service". www.gsa.europa.eu. 12 February 2019. Retrieved 17 February 2019. ^ "Constellation Information | European GNSS Service Centre". www.gsc-europa.eu. Retrieved 22 January 2019. ^ "GPS & Selective Availability Q&A" (PDF). NOAA. Archived from the original (PDF) on 21 September 2005. Retrieved 28 May 2010. ^ "EU, U.S. split over Galileo M-code overlay". GPS World. FindArticles.com. December 2002. Archived from the original on 28 June 2009. Retrieved 9 December 2008. ^ "GPS.gov: Selective Availability". www.gps.gov. Retrieved 4 February 2018. ^ "ISRO readies replacement satellite after clock failure". defencenews.in. Retrieved 22 September 2017. ^ "ISRO readies replacement satellite after clock failure". The Indian Express. 29 August 2017. Retrieved 22 September 2017. ^ D.S., Madhumathi. "Atomic clocks on indigenous navigation satellite develop snag". The Hindu. Retrieved 6 March 2017. ^ Mukunth, Vasudevan. "3 Atomic Clocks Fail Onboard India's 'Regional GPS' Constellation". thewire.in. Retrieved 6 March 2017. 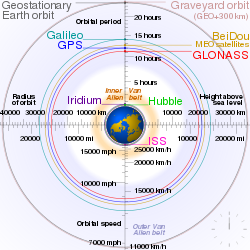 ^ "Europe's Galileo Satnav Identifies Problems Behind Failing Clocks". NDTV Gadgets360.com. Retrieved 22 September 2017. ^ Levin, Dan (23 March 2009). "Chinese Square Off With Europe in Space". New York Times. Retrieved 20 January 2018. ^ "Speech by Michel Barnier at the EU Institute for Security Studies conference". www.europa-nu.nl (in Dutch). Retrieved 19 May 2018. ^ "Galileo: Funding pledge for UK rival to EU sat-nav system". BBC News. 26 August 2018. Retrieved 26 August 2018. ^ Galileo IOV Satellites. (2014, November 3). Navipedia, . Retrieved 21:22, May 1, 2015 from [navipedia.net]. ^ "Europe adds two more satellites to Galileo sat-nav system". Retrieved 17 December 2015. ^ Correspondent, Jonathan Amos BBC Science. 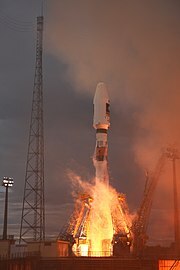 "Two more Galileo satellites launched". BBC News. Retrieved 17 December 2015. ^ "Galileo constellation deployment: Arianespace to orbit two more satellites on a Soyuz launcher in May 2016 - Arianespace". Arianespace. Retrieved 15 November 2016. ^ "Galileo satellite launches - Growth - European Commission". Growth. Retrieved 15 November 2016. ^ "Ariane Flight VA233 - Arianespace". Arianespace. Retrieved 15 November 2016. ^ "Ariane Flight VA240 - Arianespace". Arianespace. Retrieved 13 December 2017. ^ "Galileo Launch Brings Navigation Network Close To Completion". ESA. Retrieved 13 December 2017. ^ "Ariane Flight VA244 - Arianespace". Arianespace. Retrieved 26 July 2018. ^ ESA. Galileo Launch: Completing the Constellation. Retrieved 22 January 2019 – via galileognss.eu. ^ "Galileo-enabled devices | European GNSS Service Centre". www.gsc-europa.eu. Retrieved 22 February 2017. ^ "UseGalileo - Find a galileo-enabled device to use today". www.usegalileo.eu. Retrieved 22 February 2017. ^ "Motorola Moto X4 - Full phone specifications". www.gsmarena.com. Retrieved 19 October 2017. ^ Motorola. "Moto X4 | Smartphones Motorola - brmoto". www.motorola.com.br (in Portuguese). Retrieved 19 October 2017. ^ Barbeau, Sean (25 October 2018). "Where is the world is Galileo?". Sean Barbeau. Retrieved 28 October 2018. ^ "Official: Foreign GNSS Signals Need FCC Authorization for Use in United States - Inside GNSS". Inside GNSS. 16 December 2014. Retrieved 11 July 2018. ^ "FCC paves the way for improved GPS accuracy". The Verge. Retrieved 16 November 2018. ^ Grace, Neil (15 November 2018). "FCC APPROVES USE OF GALILEO GLOBAL NAVIGATION SATELLITE SYSTEM IN THE UNITED STATES" (PDF). FCC.gov. ^ Barbeau, Sean (4 April 2018). "Dual-frequency GNSS on Android devices". Medium.com. Retrieved 23 January 2019. Wikimedia Commons has media related to Galileo (satellite navigation).